An easy one pot dinner recipe that's sure to please. 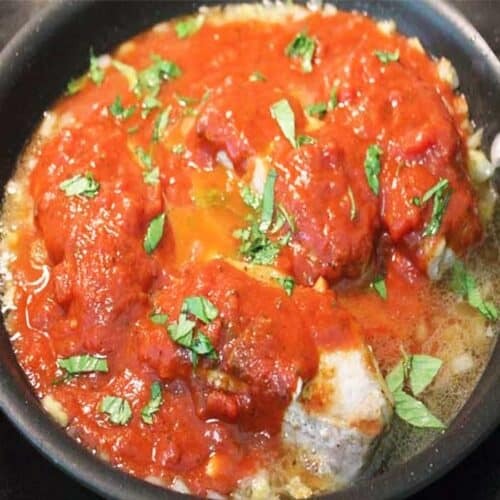 These Italian Pork chops, simmered in a rich tomato basil sauce, come out moist & tender & ready in 30! Serve over pasta to soak up all that delicious sauce. Add pork chops and brown quickly on both sides. Remove from skillet. Add onion and garlic to skillet and saute for about 5 minutes or until onion is soft and translucent. Add wine to pan and stir to deglaze (or get every last bit of that scrumptious browned pork bits off the bottom of the pan). Return pork chops to pan. Add spaghetti sauce and fresh basil leaves, cover and let cook for about 30 minutes. Serve immediately with a garnish of basil leaves.